Technically, I did not finish. But I did get over 3/4 of the way through. Maybe I will at some point pick this up again, but for now... it was okay (as my rating says). It wasn't bad, and I liked it okay. 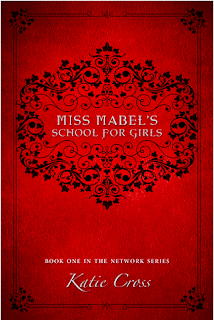 Bianca is a first-year student at Miss Mabel's School for Girls, a school of magic for girls to become witches. A long time ago, Miss Mabel had placed a curse on her grandmother, and it has been passed on to her, and Bianca may die if Miss Mabel doesn't remove the curse. I like how, at least so far, it's an all-female cast of characters. It's been a while since I've read something like that, where the story does not revolve around men/boys or romantic interests. I also liked how so much of the novel so far reminded me of Harry Potter and the Goblet of Fire. There's a competition for the top spot at the school, and only third-years (the oldest students) have ever entered the competition. Well, Bianca enters the competition, which causes quite a ruckus. That whole part was pretty fun. But once Miss Mabel entered the story, it actually made me lose interest. I know she's kind of a "baddie," but that's not why I didn't like her, since literature is full of baddies who are absolutely compelling and amazing. I don't know how to describe it. I just felt like I would've liked to see Bianca really go toe-to-toe with this woman, and those moments felt few and far between. Which makes me really not care about the central conflict. Maybe I'll finish it someday? I don't know.